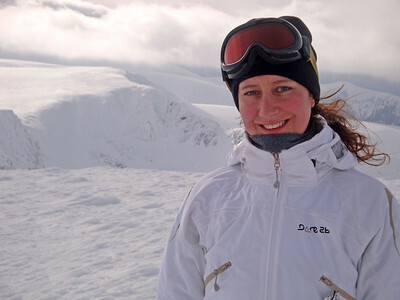 After many tedious weeks, Jasmijn successfully reached a half-way point in her research about the uptake of alternatives to animal experiments; and so we headed to the Cairngorms for a 3 day break. They're accessible by train (8 hours from London), thereby minimising carbon emissions, and the coldest winter for decades promised outstanding snow. Day 1 was spent falling from snowboards in ungainly heaps. 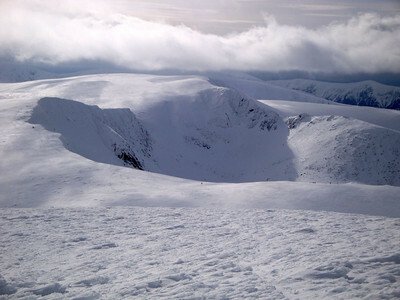 On Day 2 we enthusiastically abandoned the boards, donned skies, and hiked to the top of Cairn Gorm mountain. 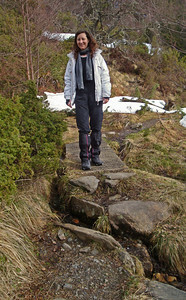 On Day 3 we hiked 20 km along snowy forest trails. 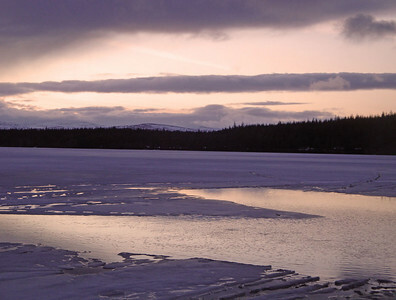 Loch Morlich sunset. We stayed in the youth hostel closest to the main range. This Loch was literally over the road. especially when the snow was hollow! 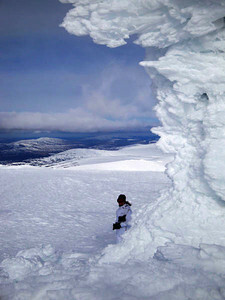 Finally we made the Cairn Gorm summit radio station at 1,244 m, which was buried under deep hoar frost. The snowy peaks stretched to the horizon. I had no idea such vistas existed in the UK, just an 8 hour train ride from London! 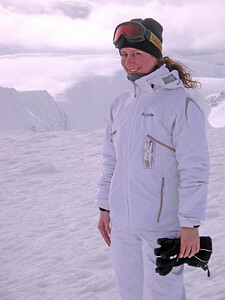 We saw groups of cross country skiers heading off into the wilderness, and longed to join them. 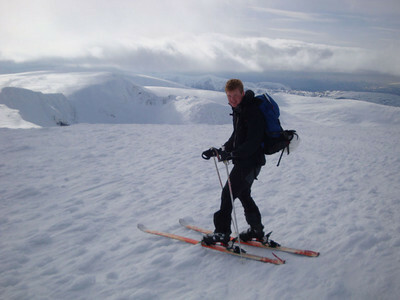 High altitude European ski-touring remains a future ambition. 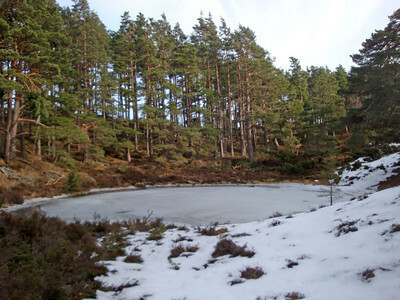 An Lochan Uaine trail. The next day, high winds at altitude forced us down into the forest trails. 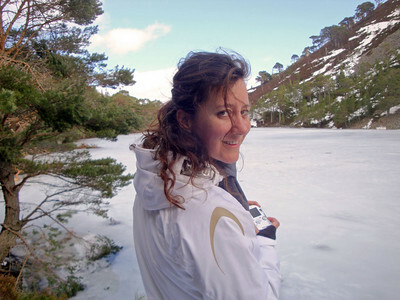 After hiking through snow for ages we found this very fun narrow trail winding down the mountain to An Lochan Uaine. An Lochan Uaine. 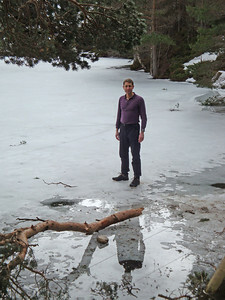 The 'Green Loch' was frozen over, although holes were starting to appear in the ice, as spring approached. But it was still strong enough to support the foolish. 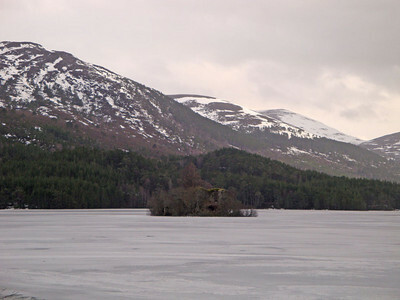 In fact, early in winter a car drove onto one of these lochs. 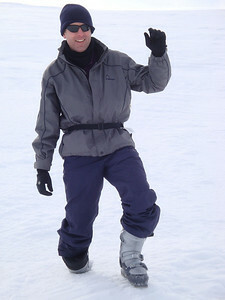 Many had footprints and ski tracks on the snowy ice. Part II of our 20 km hike: The Lochans. We got a little lost in a nest of minor lochs here, resulting in a 3-way argument between Jasmijn, I and my compass, which was won by Jasmijn. 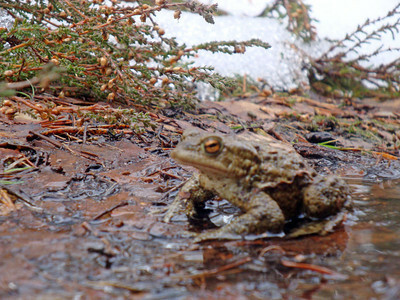 Jasmijn almost stepped on this very lucky toad. 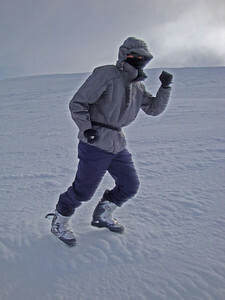 We couldn't believe they were active in the snowy conditions. Another denizen of the trail. 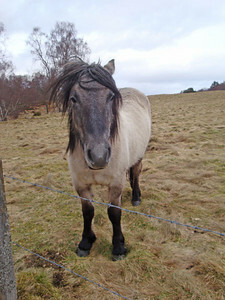 This horse and its friend had just chased me from a shortcut across their paddock. I think they wanted to eat me. Finally, after battling past numerous hazards, we made our destination - the beautiful Loch an Eilein. This castle may be impregnable within its lake most winters, but not this time. Footprint trails led out to it, but unfortunately the hot day was melting the ice. 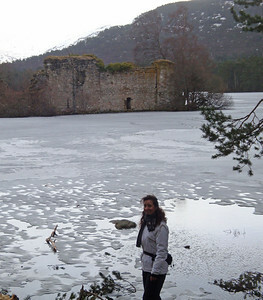 And so Jasmijn successfully managed to restrain me on dry land, with renewed determination to revisit as many Scottish loch-bound castles as possible, the next rare occasion that the ice freezes solid. 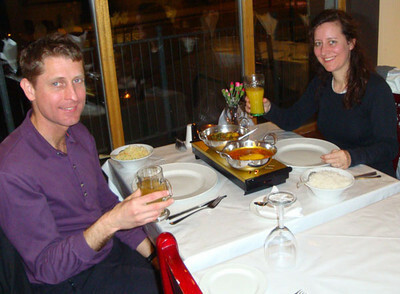 A well-deserved vegan dinner at the Indian restuarant in Aviemore - heart of Scottish winter mountaineering.